Everyone has seen a fluorescent tube light, the kind that are used in your kitchen or office and are more energy-efficient than the standard filament light bulbs. The light itself uses a number of electrical processes that are similar to those used to generate thrust from a plasma engine in space, yet few of us would make the connection between the two. A way to look at it is this: the process that lights a lot of public and private spaces is almost identical to the process that can propel a spacecraft towards another planet or in the case of the NASA probe, Deep Space 1, can propel a craft to speeds never achieved previously in space travel. Plasma engines are viewed as next-generation technologies, with large-scale thrusters currently being developed for possible use on interplanetary missions; however ion thrusters, a class of plasma engines, are currently being used on missions to provide station-keeping duties or as the primary propulsion for spacecraft. In other words: the age of plasma engines is already here! What are the similarities between a fluorescent light and a typical plasma engine? The biggest similarity is that both devices turn the gas that they contain into a conductor, so that current flows through it, and then use this to produce either light or a source of charged particles. In a fluorescent light, the electrical circuit and the internal filaments turn the inert gas (usually Argon) into a plasma, which in turn heats mercury inside the tube so that it becomes a gas. Once the mercury has become a gas it is excited by the moving electrons and emits light. This light is mostly in the ultra-violet range and so is absorbed by a phosphor coating on the inside surface of the tube, which re-emits light in the visible range. The light needs the plasma so that the mercury is evaporated; heating the mercury on its own would take more time and more power. The fluorescent light can therefore stay cooler by creating the plasma than it can by just heating a filament on its own as in the case of the standard filament bulb, or by having to heat the mercury. In addition, it can run using less relative power than a standard bulb, which is why fluorescent bulbs are often used to provide bright light in larger rooms and spaces. A typical plasma engine creates a plasma using a similar process. Electrons are introduced into a flowing inert gas, either Argon or Xenon, under the influence of either an electric field; both an electric and a magnetic field; or an electromagnetic wave in the radio or microwave frequency range. This produces the plasma, the quality of which is determined by lots of factors such as dimensions of the plasma chamber, amount of gas flow and applied power. Once a plasma is created ions are extracted using electrical fields, often using grids or orifices that have been designed to produce an optimal ion beam for operation periods of more than 10,000 hours. Plasma creation and ion extraction occur concurrently with the ions being made neutral once they leave, by emitting electrons into the beam. 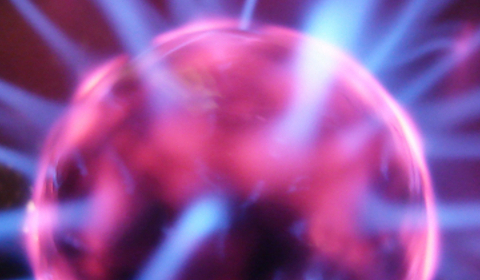 A plasma engine can only run efficiently by generating a source of ions in this way. Some other types of electric propulsion heat gas to increase its exhaust speed, hence increasing thrust, but they do not reach the same power efficiency or “specific impulse” that plasma engines can achieve using ions. Plasma engines, then, are only suitable candidates for space missions because they utilise plasma for thrust. Specific impulse, or the thrust per kilo weight (on Earth) of propellant over a time period of 1 second, is a quantity used frequently in space missions. Essentially, it relates to how much thrust can be produced by a device relative to the total mass of the fuel that can be carried on board a spacecraft. High specific impulses are much preferred to lower specific impulses, as at times the cost of having more fuel for the mission can be the cost of having to upgrade to a bigger rocket. You can see how both devices rely heavily on plasma in their design and that both types of device can be much more energy-efficient and useful only because they contain plasma. Yet when you hear about plasma, plasma engines or plasma thrusters, the mind turns more to science fiction than to the light above your head in the kitchen. Though it is true that only a handful of plasma engines are operational today compared to the ubiquity of fluorescent lights, the next time you look at that light in your kitchen or in your office, take a moment to reflect on how the glow that you can see is founded on the same process that is used to propel spacecraft to other planets. If you need a fresh perspective consider this: the European Space Agency / Japanese Space Agency mission to the planet Mercury, called “BepiColombo”, is using T6 ion thrusters, provided by QinetiQ, on its transfer module to get to the planet rather than using more conventional chemical thrusters. These ion thrusters use an internal circuit, that is different but not unrelated to the filaments in the fluorescent tube, where electrons are introduced into the gas to produce ions. You could almost say, that in its own way, an “uncle” of the fluorescent light is driving mankind’s ambitions to explore the planets, and hopefully other worlds as well! If you are a small company how can you get to launch your own satellite technology for a reasonable price? is the age of the Micro-Tier Prime emerging?